We all know Houdini's brother, Hardeen, was a gambler. Sid Radner said he "played the ponies", and it's been revealed that the reason he sold off many of the Houdini props he inherited was to pay off gambling debts. But what of Houdini? Was he gambler as well? Or did his self imposed prohibition on drinking and smoking as extend to gaming? 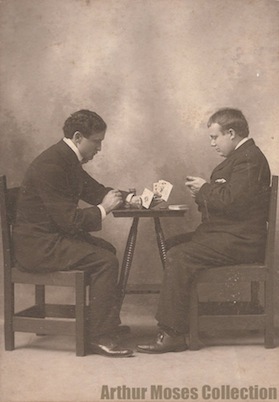 While Houdini certainly took an interest in gambling techniques, namely methods for cheating (like the famous Keplinger Holdout), he doesn't appear to have been much of a gambler himself. However, there are two notable occasions where Houdini did take to the gaming tables. Once was in desperation. The other to stem his grief. The first happened in the Fall of 1897 when the struggling Harry and Bess were swindled out of their pay at a Milwaukee Music Hall. Retreating to the old reliable Kohl and Middleton Dime Museum in Chicago for work, Houdini is said to have "plunged into a game of craps to retrieve his fortunes." Instead he lost $60 (this at a time when he was making at best $25 a week). According to Harold Kellock, Houdini had to promise Bess that he would never gamble again -- "and kept his promise with fair circumspection." 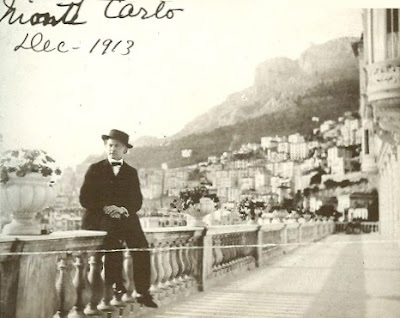 But even his winnings did not brighten his spirits during the dark days of 1913. Instead he made repeated visits to a cemetery reserved for people who had committed suicide. He noted in his diary that the casinos, hoping "to keep things quite", stuffed money into the corpses' pockets to suggest it wasn't gambling losses that led them to take their lives (he doesn't record how he came by this info). So maybe it's best Houdini wasn't a big gambler. He might not have found many willing partners to play with him. I mean, would you play cards against Harry Houdini? To learn more about casinos in the U.S. and abroad, check out this article on Casino History, which includes Houdini's lucky casino in Monte Carlo. UPDATE: See the comments section for a Houdini gambling story that I missed. I recall reading that HH was forced to break in to a casino at gun point to open the safe and would up getting shot in the hand. Any info on this story? Yep, that's a story you can read about in several bios. I didn't include it here because it really wasn't about Houdini gambling himself. Houdini is said to have carried the bullet in his hand all his life. But is the story true? Well, we only have Houdini's word for it. I thought I saw an x-ray of that hand, with the bullet intact, but can't remember which bio it was in. Whatever happened, I'm pretty sure he was shot in the hand! I know the x-ray shot is in Patrick's books. Might also be in Kalush? The story does seem a little hard to swallow. You might have add in those hundreds of cash challenges he made with Houdini imitators and the spiritualists. I would think those were bets. I also remember in the Kellock/Bess book that he won $40 in a crap game too. I think it was in Arizona and bought everyone ice cream with the winnings. Ha! Good point about the challenges, Kevin. Yeah, I thought I read about both of those crap game stories in one of the bios---not Kellock's though. That's one of the few Houdini bios I've not read. Maybe it was Silverman's bio? I also looked through Silverman for this. See, I also vaguely remembered a story in which the young Houdini did well gambling (I thought it was playing poker). My original slant on this post was that Houdini didn't gamble often, but when he did he was a winner. But I couldn't find this particular story, only the story of when he lost, so I had to rethink this. Beth, you should read Kellock. It's a treat. I'm going to re-read the whole thing again. It's been years. It's the best book to get a feel for Bess. You know, having read the same sections of several bios for this (1894 to 1899), I'm kinda shocked at how many of the later bios pretty much copied from Kellock. The same incidents are told in the same progression of paragraphs, etc. Gresham is very close. Only bio that wasn't the same was, you guessed it, Silverman. Ice cream anecdote is on Page 129-130 of Kellock. Damn. There it is. I stopped as soon as I saw the name Martin Beck, literally a page before this. Shoot. Would have been a nice addition to this blog. Sure look like Houdini's game was craps. Wonder if that's what he played in Monte Carlo? I've also wondered which game HH won at Monte Carlo. According to the late Tony Giorgio, the game with the best chance of winning in casinos is craps. It could have been something HH learned in the streets of Appleton, Milwaukee, or N.Y.C.